Northern Ontario is littered with some of the best fishing in North America. With that in mind it didn’t take much convincing for us to fly north and spend a three-day weekend targeting burbot, brook trout and splake in hopes of filming Pautzke Outdoors. With good weather on hand doing so wasn’t going to be a problem. However, hoping to take advance of favorable conditions on Friday and with plenty of good ice around we opted to target pike in the greater Thunder Bay region. Pike wasn’t on the first must-do list. On the other hand, we had a few hours to kill and wanted to try a few new baits on them rather than waiting at the motel to target burbot under the stars. Having never been to this particular fishery we weren’t sure what to expect. Unfortunately, none of our local buddies had ever fished it, either. 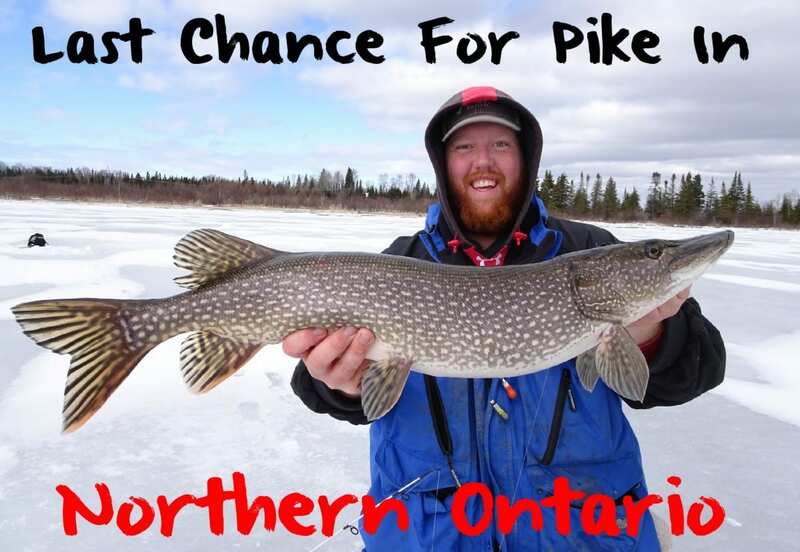 We were winging it and hoping for success in a lake the Ontario Ministry of Natural Resources listed pike inhabiting. The good news was there was plenty of ice Friday when we popped a few holes. Most of the ice ranged from 18 inches to two feet. The hard part was knowing where to fish. However, like most anglers who were fishing a new lake we focused on coves, points and inlets. While we didn’t catch a ton of pike we did catch and release a few quality fish. In all, it was a good start and a bonus to our trip. 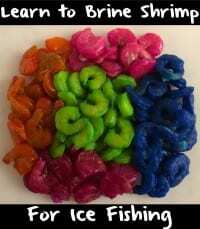 Our arsenal included two baits: live Fire Dye sucker minnows and Fire Brine herring. Fortunately, we got bites on both, although action was slower than we expected. In the five hours we fished we caught five and missed a few others. For cut bait we used Purple and Chartreuse Fire Brine herring, whereas Chartreuse and Blue Fire Dye suckers took the largest pike. We dyed the sucker minnows on site and found tremendous colour in them. The brined baits were done the night prior. As a matter of fact, a few of our Blue and Chartreuse Fire Dye sucker minnows were taken off the hook by pike without us catching them, which makes us wonder how large they were. Not surprising, we found pike from five to 30 feet deep and weren’t able to establish a pattern given the short time we had to fish. We soaked baits for 45 minutes before moving a few hundred yards to try another spot. Of the four spots we focused on only one didn’t produce and that was a small creek inlet with eight feet of water or less. Editor’s Note: Northern Ontario ice conditions are expected to slowly diminish. Always make sure the ice is safe prior to venturing out on it. 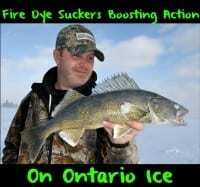 Pautzke Fire Brine and the new Fire Dye are available from Amazon.ca and at Ontario Cabelas and Bass Pro Shops.